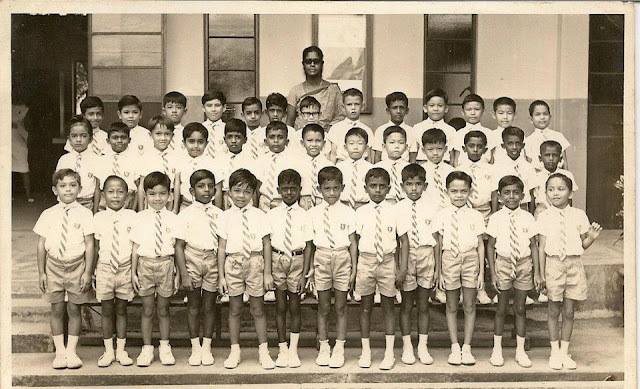 3rd Row (Top) - Devendran Selvarajoo, Keith de Souza, Jerome Jambu, Philip Selwyn Lemos, Peter Lourdes, Robert Francis, Norbert Alfonso, Dudley Perreau or Mohd Rasul, Christopher Selvaraj, Fons or Pereira Gerard Alphonsus, Dennis De Witt, Jude Chua and John Sequera. 2nd Row (Middle) - Maninder Singh, Gerard George, Howard Wyreweden, Ramesh Subbaraman, William Anthony Dorai, Kevin Magnus, Terry Rodrigues, David Lim, Lewis Koh, Matthew Ngui, Denis Marie, Simon Mahendran and George Pereira. 1st row (Bottom) - Trevor Boniface, Patrick, Lam Yew Chong, Sundram Premandha, Anak Shaik Ahmad, Bernard Paranjothy, Trevor Fernandez, *Justin Morais or Morales? *, Michael Arriola, Malcolm Gomes, Gilbert Rozario and Mark de Souza. Philip Selwyn Lemos ~ person resposible of this photo coming into my possession. Terence Rodrigues ~ has an amazing memory with the naming mostly done at one go and with very little (almost negligible) help from the others. Gerard George ~ helped me remember our Form Teacher's name.